This 38mm. 1995 Stainless Steel on leather LONGINES LINDBERGH GMT with stainless steel buckle, automatic movement, caliber: L 635-2, universal time (24 Hours Universal Time on outer rotating face in accordance with the main time), 45 hours power reserve, limited edition to 3000 pieces, hours, minutes, seconds, date at 3 O’clock, brushed bi-directional rotating bezel, display back, sapphire crystal, water resistant to 3 atm. This watch is EXTREMELY hard to find, as most collectors have hung on to this watch due to its stunning vintage look. This LONGINES GMT comes complete with its box and all papers. 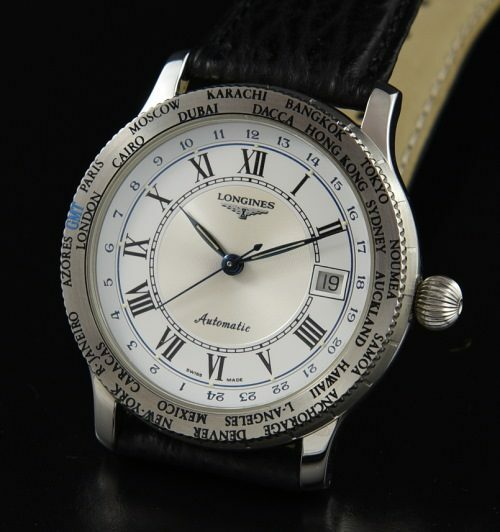 This is one of the best looking modern LONGINES watches ever produced!